Join us amid some of Northwest Ireland’s finest scenery on our Donegal And The Giant’s Causeway tour, discovering and exploring a land of rivers and loughs, towering mountains and sheltered glens, where the Irish language is still widely spoken and traditional music rings out from the pubs and bars of its ancient villages and towns. Based in the lively town of Letterkenny, you’ll discover the astonishing rock formations of the Giant’s Causeway, wander historic Donegal town and visit beautiful Glenveagh National Park. You’ll also explore the Inishowen Peninsula, a timeless, remote area steeped in heritage and antiquity. Single supplement applies. Subject to availability. Fly to Belfast, meet your Tour Manager and transfer to your hotel. Depending on your arrival time, you’ll be able to spend the rest of the day exploring the town of Letterkenny or relaxing in a local pub or cafe. Today, head to Donegal, where the town’s history is reflected in a Jacobean castle and ancient marketplace, the ‘Diamond’. Stroll around the streets and explore under your own steam, or board a waterbus for a different perspective on the town and its surroundings (and resident seal colony) on a 70-minute trip around Donegal Bay (payable locally). Today we’ll travel, past the pretty, remote town of Carndonagh and across the stunning Inishowen Peninsula, to wild, windswept Malin Head – Ireland’s most northerly point. You’ll also spend some time at the fascinating Doagh Isle Famine Village, where 19th-century Irish life is recreated, before returning to Letterkenny in the evening. 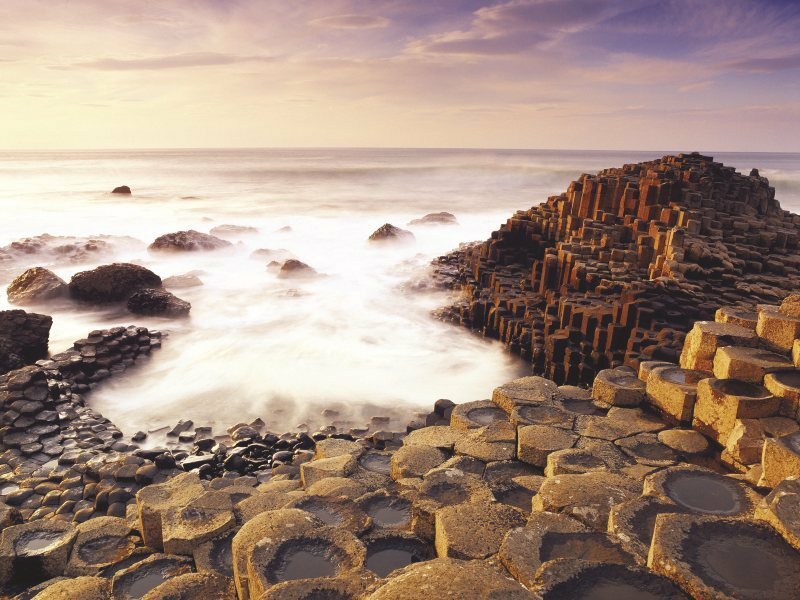 This morning, travel to County Antrim’s Atlantic coast to visit to the Giant’s Causeway. Long associated with legendary Irish hero Finn McCool, its basalt columns, which rise like stepping stones from the sea, were formed after a volcanic eruption 60-million years ago. Take the short minibus trip from the visitor centre to the Causeway, or walk the mile or so along the cliff path to take in the views. After time for lunch (payable locally), continue to Dunluce Castle. Rising dramatically from the rocks above the sea and separated from the mainland by a deep chasm, the ruins of this medieval stronghold are among the most extensive in Ireland. It’s a beautiful, wild and astonishingly atmospheric location, so make sure you have your camera to hand. On today’s tour you’ll take in still another region of outstanding natural beauty as you explore the contrasting scenery of rugged, remote Glenveagh National Park and Glenveagh Castle, in its peaceful setting overlooking Lough Veagh. Enjoy a guided tour of the historic castle’s square keep and mismatched round turrets, then wander the surrounding gardens at your leisure. Afterwards, head to the coast, via Mount Errigal and through Dunlewy village to Bunbeg. Here, you’ll have the chance to stretch your legs with a stroll along the sandy beach before continuing up and around the Bloody Foreland (named for the red hue of the rocks at sunset), to the little village of Gortahork and finally back to Letterkenny. Transfer back to Belfast for your flight home, taking with you some wonderful memories.